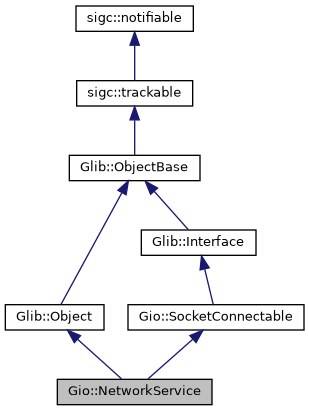 A GSocketConnectable for resolving SRV records. Like NetworkAddress does with hostnames, NetworkService provides an easy way to resolve a SRV record, and then attempt to connect to one of the hosts that implements that service, handling service priority/weighting, multiple IP addresses, and multiple address families. See SrvTarget for more information about SRV records, and see SocketConnectable for and example of using the connectable interface. Gets the domain that srv serves. This might be either UTF-8 or ASCII-encoded, depending on what srv was created with. Gets srv's protocol name (eg, "tcp"). Get's the URI scheme used to resolve proxies. By default, the service name is used as scheme. Gets srv's service name (eg, "ldap"). Set's the URI scheme used to resolve proxies.